Whether you want a platform to advertise your catering business on or you want to simply list your catering services online we have selected the best catering WordPress themes for you. If you choose to use one of these themes you will have a modern and professional website to showcase your business to the world. All the catering WordPress themes on this list are high quality, easily customizable, and containing a bunch of options. Even if some of them might look similar, they all bring something unique to the table. With them you can choose to use one of the pre-built demos, change colors and fonts, or create the entire layout of your website yourself using the integrated page builder some of them come with. Royal Event is a creative, unique, user-friendly, and feature packed catering WordPress theme that can be used for different businesses, but it is ideal for catering related websites. 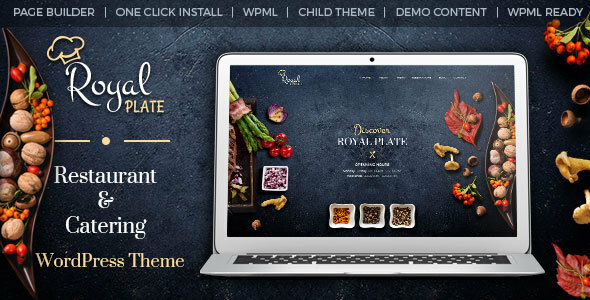 Royal Event includes an advanced demo installer that takes only one click to reproduce the demo look of the theme. Royal Event comes with dazzling homepage demos that are fully responsive and adaptable to all devices and browsers. Moreover, Royal Event is SEO optimized and translation ready. With this theme you get full control over your layout and what your visitors will see. Try Royal Event! 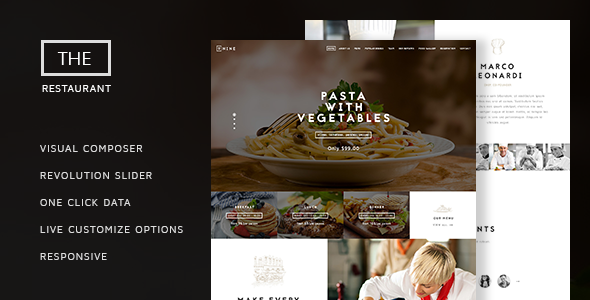 Chef is an attractive, attention-grabbing, and modern catering WordPress theme that will make it easy for you to launch your new website. After you install this theme you will immediately notice its features starting with its amazing 6 full demo homepages. Each homepage demo can be applied to your website to give it a new look or get you started. After you chose your front-page layout you can customize it using one of the 8 color schemes and then play with the integrated Slider Revolution to create a custom slider. Chef is the catering WordPress theme you’ve been looking for! 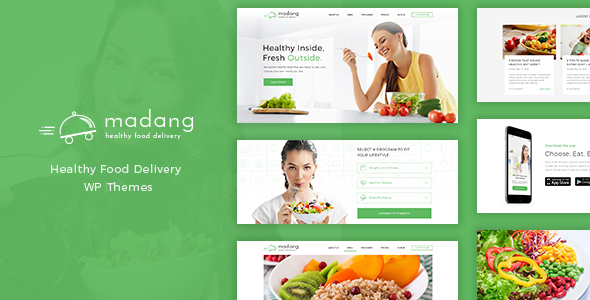 In terms of design and functionality, Madang is one of the most competitive catering WordPress themes. To help you build the website of your dreams, Madang comes with several different layouts, dietitian filter, meal plans, nutrition calculator, nutrition table, support department section, promotional sales, pricing tables, Google map, and blog page templates. Thanks to its simple design your visitors will easily find the service they are looking for and purchase. Additionally, Madang has a full responsive design. Check out the live preview for this theme! 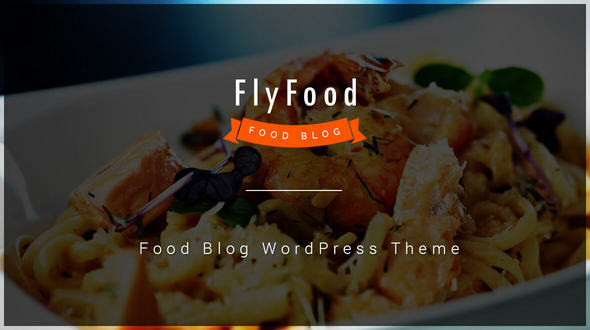 FlyFood is a beautiful, well-organized, stylish, and cool catering WordPress theme designed specifically for a food related blog or business. With FlyFood you have complete control over your layout and you can choose from 3 stunning homepages to get started. You also get menu, reservation, shop, gallery, and recipes page and shortcodes. Moreover, FlyFood also comes with a drag and drop page builder, 3D slider, posts slider, WooCommerce integration, and a form builder. Go check it out! Daiquiri features several pre-designed page layouts and a powerful header and footer builder to help you craft a professional and beautiful custom design for your website. Apart from this, you also get a one click demo installation, ThemeRex addons plugin, custom post types, sidebar manager, custom layouts, unlimited colors, sticky menu, Google map, and gorgeous fonts. With these features you will be able to build an eye-catching homepage that your visitors can interact with. 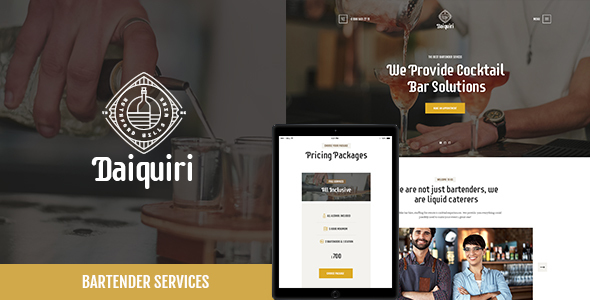 When it comes to catering WordPress themes, Daiquiri stands out! Royal Plate has been developed and designed to assist catering businesses promote their services online. No matter the type of catering services you offer, Royal Plate is very flexible and highly customizable to fit any needs. Royal Plate comes integrated with mesmerizing page layouts, various menu designs, custom widgets for menus, full width galleries, reservations form, sticky nav bar, and newsletter form. If you need support in regards to Royal Plate and its features you can get it from their support team which is always there for you. Increase your business’ popularity with Royal Plate! 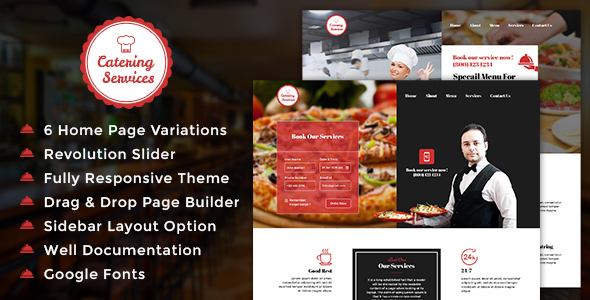 The Restaurant is an incredible catering WordPress theme that comes with a ton of features you can select from. This makes it a flexible and versatile theme ideal for creating food related websites. The design and layout are completely up to you thanks to its integrated Visual Composer drag and drop page builder and custom slider. All the theme’s customizations are done from the admin panel and through a live customizer so you can see it all in real time. The Restaurant will help you get the look of your website right. Spoon gives you the opportunity to develop a professional and good-looking design for your catering business without too much effort. 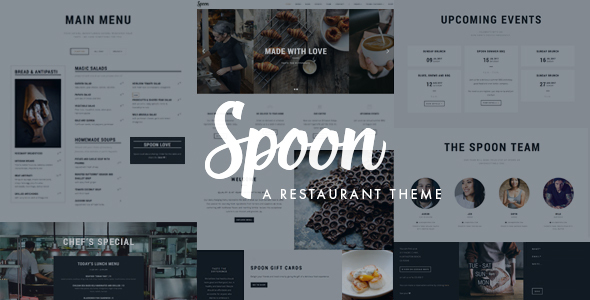 For this purpose, Spoon includes one and multi-page layouts, Google map, social media integration, responsive and fluid design, limitless food and drinks sections, event manager, and online shop page. If you are not feeling particularly adventurous you can play around with the 9 integrated page templates. Spoon is a great choice! 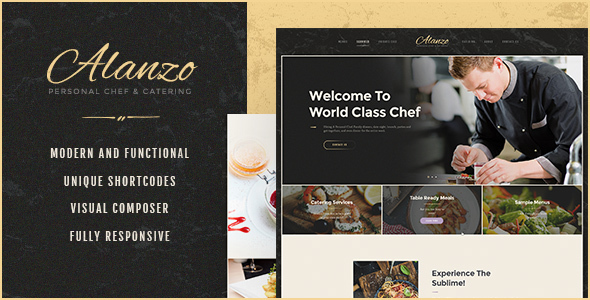 Alanzo is a modern, fresh, and elegant catering WordPress theme that contains all the features an online catering business needs. Alanzo is very versatile and will help you achieve any type of layout you wish. Installation and demo import can be done with only one click to get you up and running in a jiffy. To allow you to craft beautiful pages for your food services, Alanzo comes bundled with Visual Composer and Slider Revolution. These two powerful plugins will give you plenty of customizing options and layout features. This makes Alanzo be worthy of its stop on the best catering WordPress themes list. Grenda might only have 2 already built homepage demos, but they were perfected for a catering business. Grenda also offers an original page template to showcase your company’s information along with a clear design for your services. Moreover, you can add important details about venues, portfolio, team, location, and much more. 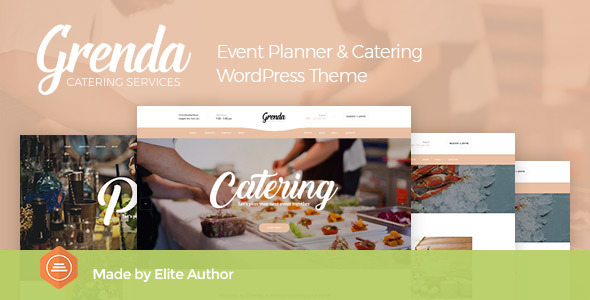 If you are looking for beautiful catering WordPress themes that are easy to set up and intuitive, then check out Grenda! 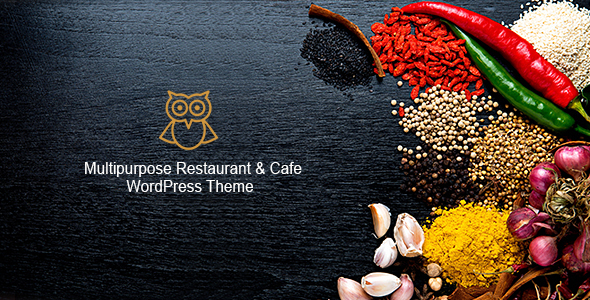 Owl is a multipurpose WordPress theme that can be used any type of food related website. This theme is a strong choice for a catering website because it comes with a bunch of features that can prove useful. For starters, Owl has 3 homepage demos you can select to use for your website. Each of them is completely responsive and will increase your chances of getting customers. It also comes with an online booking system, menu styles, events, classy page templates, one click demo import, sticky header, footer options, and unlimited color options. Vienna features lots of powerful tools and options thanks to the Redux framework. Vienna’s design elements and features will help you stand out from the competition and gain more clients. With this theme you can promote your events and fundraisers, present your team, display your restaurant and business, and promote your meals and menu items. Other impressive features Vienna has are custom widgets, one click demo import, integration with WPML and Visual Composer, and custom post types. Vienna will cover all your needs! 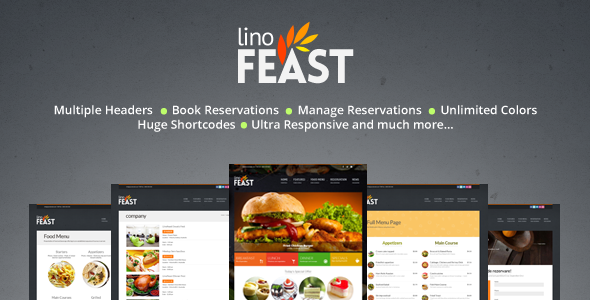 LinoFeast is an elegant and modern looking catering WordPress theme developed specifically as a platform for food related websites. It is a piece of cake to set up your website with this theme, especially with the one click demo installation. To create the homepage layout you can use food menus, reservations, Google fonts, parallax effects, custom header, carousel presentations, and unlimited colors. When visitors will reach your website they will be presented with your services and food offers making it really easy for them to choose. Taking into consideration its design and options, LinoFeast fits perfectly here as one of the best catering WordPress themes! Charlotte has a clean and fresh look that will certainly make a good impression on your audience. While this theme might seem simple, it is anything but. 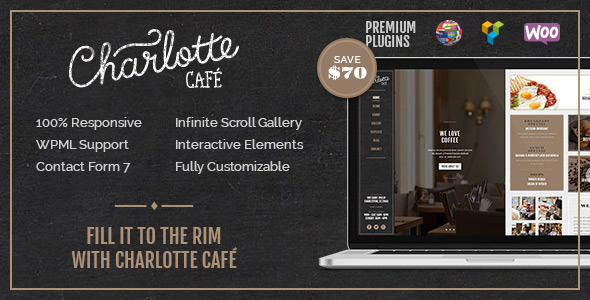 Charlotte is GDPR compliant, comes with several plugins for free, a swipe menu, powerful customizer, infinite scroll gallery, full width layouts, Ajax galleries, and a page builder. With all these tools you get to choose what your audience sees and how your elements are displayed. If you want to promote additional information about your catering business you can use the blog feature Charlotte has. Make sure to check Charlotte out! 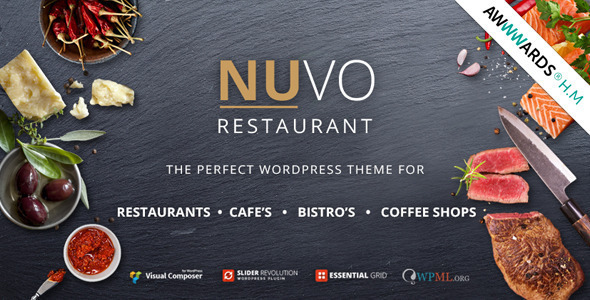 Nuvo is being marketed as a flexible restaurant WordPress theme but it can be used for a catering business thanks to its numerous features. With Nuvo you get multiple demos along with a coming soon page, video tutorials, parallax scrolling effect, menu builder, booking manager, events manager, online shop page, page builder, Essential Grid, and lots of Google fonts. If you are searching for a complete theme with many options, Nuvo is worth a look! 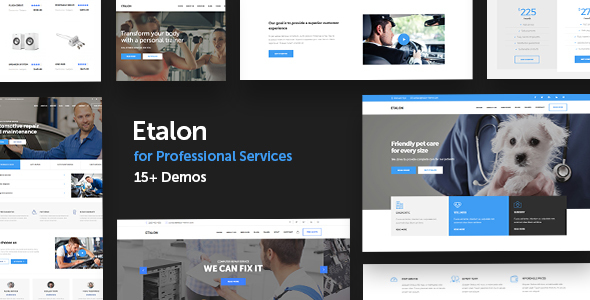 Etalon has been crafted to help build powerful websites no matter the domain or industry. While Etalon is a multipurpose theme, it also has features specifically added to be of aid for food related websites. Etalon has multiple demos for various industries and one of them is for catering businesses. Other useful features include contact forms, opening hours, business profile, portfolio carousel, photo gallery, service tabs, pricing tables, and a coming soon page. 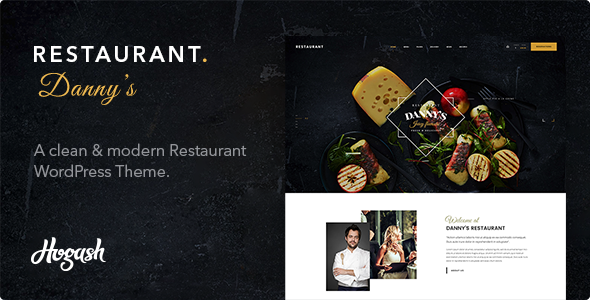 Restaurant Dannys was developed for restaurants, cafes, pubs, and catering websites. This means Restaurant Dannys is a truly versatile theme that can be suitable for anyone looking for a food related theme. This theme incorporates a potent drag and drop plugin, Zion Builder which is also found in the popular Kallyas theme. Other features this theme has are online reservations, video tutorials, order online form, unlimited colors, Google fonts, Revolution slider, Google maps, and more. And of course, Restaurant Dannys is optimized for speed and mobile compatibility. This theme from Template Monster aims to be the best of the best when it comes to catering WordPress themes. It is a fully editable and customizable theme that comes with custom post types, WPML compatibility, more than 80 shortcodes, customizable typography, 2-step installation, integrated customizer, and beautiful sliders. Each of the features this theme provides has been designed specifically for attracting new customers. 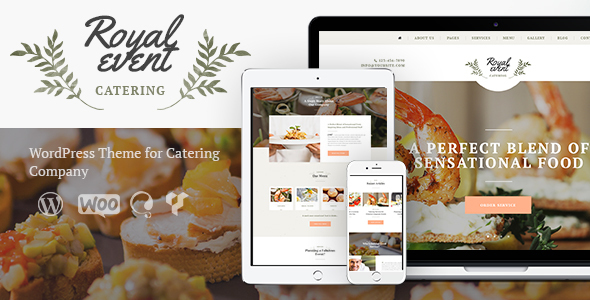 Your catering website will look incredible if you use this theme! While there are not that many catering WordPress themes, we made sure to feature here only the best ones. Check them out and using the information provided make a choice and take your business to the next level. If you have any suggestions, we’d love to hear them out.